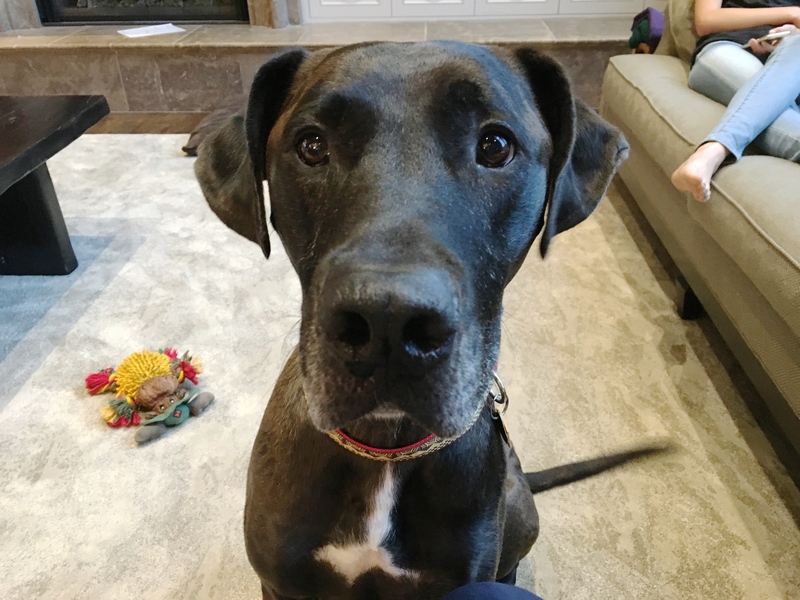 Ruger is a four-year-old Great Dane mix who was recently adopted. After a few days he started growling, lunging and air nipping at family’s father. He has also been aggressive to livestock on their property. His new guardians set up a dog obedience training session with me to address these issues. When I knocked on the door for the session Ruger charged the door and jumped up to pound on it with his front to paws with such force he knocked down the decoration hanging on the door. I had taken some precautions before I arrived for the session; wearing pants from the previous day that included the scent from the dogs I worked with yesterday as well as chalking my shins with a high-value treat scent. I also offered some high-value treats to make sure that Ruger had a positive association with me before I even came in the door. I could see that Ruger’s ears were positioned in a way that indicated that he was coming from an insecure place. I pulled out a leash and attached it to his collar which seem to settle him down considerably. This was when I got the idea on how to incorporate a little unorthodox leash training. After exchanging greetings with the family’s mother, she started to lead me into their living room. We had to go down a couple of hallways to get there and as we progressed, Ruger started to get more and more excited and animated. Because dogs often getting to the most trouble when they are in an over excited state, I paused frequently to give Ruger mini timeouts to calm him down. The family’s father was away at work and would not be joining us for a bit which gave me an opportunity to discuss the situation with the other members of the family. I learned that Ruger was primarily reacting to the family’s father but also does displayed some unwanted behaviors to some male workers around the house. It’s likely that Ruger had some unpleasant experiences with males somewhere in his past. After discussing the situation further, I got the impression that the family’s father was taking a softer approach to try to be more accommodating to the dog and that Ruger was trying to assert himself in this new setting. This could lead the dog into thinking that he could assume a leadership role. But because Ruger was slightly insecure, this is a bad combination. I went over a couple of ways to incorporate structure to help Ruger start to identify as being in a follower position. Things like enforcing rules in a timely basis and asking him to earn praise by sitting or laying down can go along ways towards helping the dog feel more like a follower. Often times when a dog feels that it is in a leadership position but is not very confident, this can cause additional stress which can cause the dog to react in ways that we do not want. I pulled out some high-value treats and Ruger responded to them very well. I spent a couple of minutes explaining how the guardians can incorporate these treats with an introduction to unknown males to help Ruger start to develop a positive association to them. This is a variation of a counter conditioning technique. If applied consistently, it should help Ruger start to identify new males arriving as a good thing rather than something to be alarmed about. As we were wrapping up the discussion on positive association, we got a text from the family’s father who said he was in the driveway. We told him to come in but to move slowly and without any big movements. As soon as Ruger saw the family’s father, he started growling and barking. I had the family’s father sit down at the kitchen table about 25 feet away from us and explained the technique I was going to use. I really have to give the family’s father a lot of props. It takes a special kind of person to rescue a dog into your home and then be patient while the dog acts in such a manner. The world needs more people to display the sort of patience. Because I had such a positive response with the leash, I had the father step outside so that we could re-create the greeting and utilize the same technique that I used. The father was using a little bit more intensity in his corrections then I would like. I would actually have preferred to use a completely different method that was only focusing on positive reinforcement. But because this situation was getting more serious by the day (I learned that the father had taken to sleeping in another room as the dog got upset if he would get out of bed and also chased him up some stairs lunging), I knew I needed to be more aggressive in my approach than I usually am. As the family’s father gets more comfortable with the dog and the leash technique, he won’t need to use the same corrections on the leash. I have t say that I was quite pleased at how quickly Ruger’s behavior changed when we incorporated the leash. I recommended that the family’s father continue leashing Ruger up in this fashion and keep him on a leash with him whenever he is at home for the next week or so. This will help Ruger adopt a follower position with the father while also making sure they spend so much time together that they really bond and cement in a healthy relationship. But I also wanted to come up with a technique that did not incorporate a leash as it’s not practical for a dog to be dragging one around all the time. In fact, it can be dangerous if a dog is dragging around a leash unsupervised. I spent a couple of minutes demonstrating a Watch exercise, then coached the family’s father through it himself. The family’s father will need to remember to use a two motion approach to the Watch exercise. As soon as the dog voluntarily looks up at his face, the father needs to raise the treat vertically off of his knee so that it is positioned about 6 inches in front of his nose. The idea is to hold a treat in a way that keeps the dog looking at his face. The other family members asked whether or not they should be practicing this technique before I had a chance to tell them that I wanted them to do just that. In time, the members of the family should be able to say “watch” and have Ruger sit down and look up at them. This will allow them to redirect him and focus his attention. It was really heartwarming to see how endearing the dog was being to the family’s father after the watch. Only 45 minutes earlier he was lunging, growling and snapping at him. By the end of the session, Ruger was laying on the floor at the father’s feet with his head on his knees while completely calm and actually affectionate. Seeing the smile on the father’s face as he petted Ruger was the highlight of this session. The family’s father had to leave for a business meeting a few minutes later and when he got up and walked away, Ruger did not respond at all. It’s going to be important that Ruger no longer sleeps in the guardian’s bedroom and instead uses the dog room. The family needs to all practice my petting with a purpose technique, consistently enforce all the rules and correct Ruger immediately anytime he violates them. I’m guessing within a week, Ruger’s unwanted behaviors towards the family’s father will only be a memory. The family will likely need to leash the dog and use my positive association technique anytime males come over for the next couple of weeks or so. With enough practice, Ruger will start to associate the arrival of unknown males as something to look forward to.